The electromagnetically controlled valves and locks that are commonly available today are certainly quick acting, but they also tend to have only two operating states: ‘on’ and ‘off’. If, for example, an electromagnetic door lock is energised, the bolt is driven powerfully into the strike plate. When the lock is de-energised, the bolt is retracted by a spring. Getting these devices to do more, such as getting a valve to maintain some intermediate half-open position or requiring a locking bolt to close less abruptly, is a costly exercise, involving additional sensors and a complex control system. 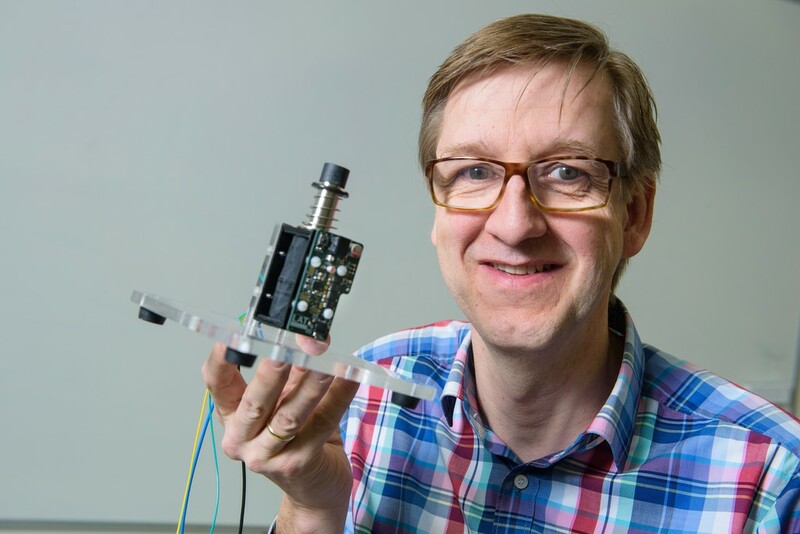 Now, a new approach developed by drive systems specialist Professor Matthias Nienhaus and his team at Saarland University offers a means of achieving greater control of electromagnetic valves and locking devices without the need for additional sensors. All that is needed is a magnetically permeable metal bolt that moves within a coil of wound copper wire. Using a patent-pending control methodology, it is possible to keep the bolt in any desired position without the need for additional position sensors, simply by analysing the electric current that flows through the coil. Users can determine where the bolt is and can adjust its position instantaneously. For example, the locking bolt can be made to enter the striking plate softly and to precisely maintain any desired intermediate position. The device is no longer simply a two-state system, but can act more like a water tap in which the extent to which the device is ‘on’ or ‘off’ is continuously variable. The only information that is needed is the electric current that controls the movement of the bolt. "We monitor how the current flowing in the coil changes with time. Specifically, we record the fluctuations in the electric current over a certain period of time and analyse them. These current fluctuations change depending on the position of the bolt. This allows us to determine exactly where the bolt is at any particular time. Knowing where the bolt is, means that we have an effective means of controlling its movement," explains Nienhaus. However, the unprocessed signals that the researchers initially record are far too noisy to deliver any meaningful information about the status of the device. Using their new method, the drive systems engineers in Saarbrücken are able to filter out a clean measurement signal. "We smooth the raw signals using our new integrating method that is now covered by a patent application," Nienhaus adds. 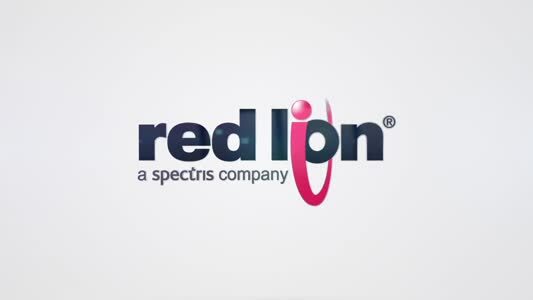 "Our method provides us with a measurement signal that is practically noise free. We use the signal to position the bolt where we need it, and we can even position it a little bit beyond the end of the coil. The demonstration clearly shows the speed and precision of our new control technology. 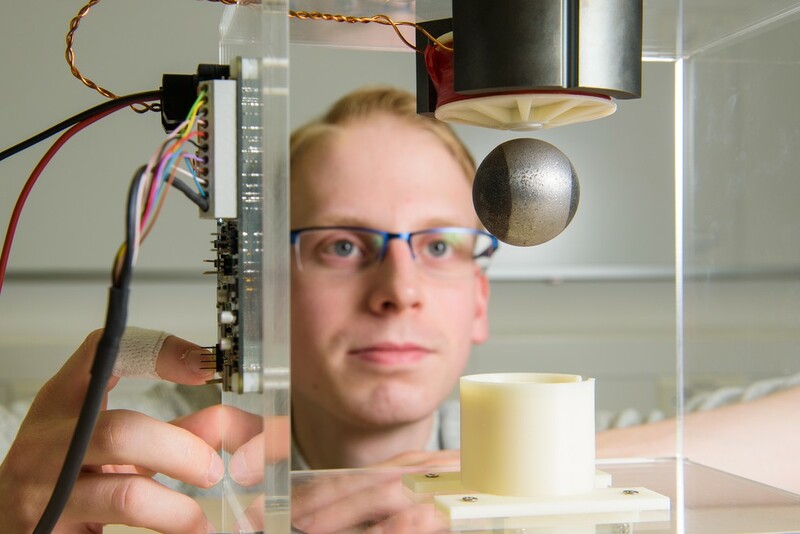 We are effectively juggling a steel ball using nothing more than the device’s own current signal – without the need for any additional position sensors."